This April 44 teams from all over the world took part in Microsoft Research’s annual localization competition in Seattle. The researchers from FOKUS came in on the 7th rank for an accuracy of less than 50 cm in 95 percent of the samples. No matter if you take a look at a railway station, an airport or a shopping mall many people have difficulties to get around in complex buildings which they are not familiar with. Since the GPS-signal lacks accuracy in indoor localizations, companies, startups and academia from all over the world deal with indoor navigation. From April 13th –17th 2015 44 teams took part in Microsoft Research's “Indoor Localization competition” to test the accuracy of their indoor navigation solutions. In a conference venue of 2000 sqm the accuracy was evaluated at 20 checkpoints while the teams used their indoor navigation to get from one point to another. At each checkpoint the jury compared the actual position with the coordinates that the navigation system thought it would be at. The solution of FOKUS had an accuracy of less than 50 cm at 95 percent of the checkpoints and came in on the 7 th rank. While the results of the leading seven participants were in a range of some decimeters the coordinates of the team coming in 8th ordinarily differed 1.37 meters. 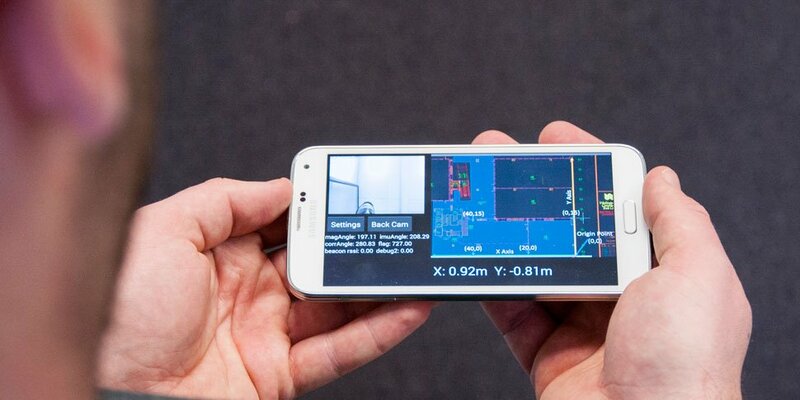 A smart phone to fuse all kinds of sensor data (i.e. : Accelerometer, Gyroscope or Magnetometer) as well as to display the navigation and the current location. A wireless sensor which is attached to a shoe in order to measure the step width. A map depicting the magnetic characteristics of the building which needs to be generated in advance. This map supports the localization via abnormalities in the magnetic field that are generated by steel girders or radiators. Inexpensive Bluetooth-beacons which are attached to door, walls or the ceiling. When a person enters a building these sensors enable an initial localization and a collaborative localization adjustment. Normally the whole system needs at least one Bluetooth-beacon but in the competition one was allowed to use up to 10 of them. Instead of using Bluetooth-beacons one can use optical markers, too. These optical markers, which can be used in addition to the Bluetooth-beacons as well, work like QR-Codes. Being placed either on walls or the ceiling the smart-phone's camera recognizes them. The integration of different localization techniques creates a robust localization system which comes along with another benefit: Its approach is really inexpensive in comparison to other methods which use a laser scanner or special antenna equipment, for instance. Moreover Fraunhofer FOKUS offers a seamless navigation between indoor and outdoor. It was developed in the project M4Guide for example for people who are blind or have a visual impairment.